Our curriculum covers mornings for one or two weeks and “visits” The Culture of Peace once per week, plus four other world cultures for one or two mornings each. World Tour I Itinerary includes Australia, India, Greece, Ghana, Morocco, Brazil and Native North America. For full-length summer camps that would like to offer their campers an opportunity to explore our world and peace-making techniques, we offer 1-hour sessions from one to five times per week, of one culture per week, for up to 12 weeks. We also offer our "Peace Thru Play" program combining classroom instruction with an interactive drama workshop, "Only One Lemon". Custom-tailored itineraries ensure that campers can explore different cultures each camp session. These programs can also be integrated into after-school programs during the academic year, as value-added components eligible for funding. 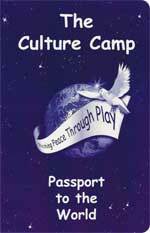 TRAVELING TOWARD PEACE This curriculum combines our Culture Camp Summer Sundays curriculum with an innovative custom-tailored peace play designed to identify relevant conflict situations and bring clarity to possible solutions by using wisdom from world cultures as problem-solving tools. PEACE THRU PLAY WORKSHOPS Our interactive drama workshops teach conflict prevention skills and other peacemaking techniques through exploration of world cultures. Peace Thru Play workshops are available as in-person appearances in the South Florida area, or as pre-packaged programs for our customers in other locations. The one-hour workshops can be combined with classroom sessions in custom-laitored programs, or used as a stand-alone presentation. FOR FAQ PLEASE CLICK ON CURRICULUM TITLE. TO ORDER PLEASE DOWNLOAD AND PRINT OUR ORDER FORM. Experience "Sunday Camp" with a modified version of Culture Camp in 1-hour sessions per culture, emphasizing peace building lessons and activities in each culture "visited". End the summer with a Multicultural Festival that showcases the crafts and information learned. Full-length version - This 26-session curriculum covers seven world religions in chronological order, devoting four 1-hour sessions to the fundamental beliefs, creation story, holidays and rituals, and peace heroes of each. The yearlong curriculum teaches kids from K to 3rd grade to appreciate earth-centered religions, Hinduism, Buddhism, Judaism, Christianity, Islam, and Unitarian Universalism, plus single sessions on Jainism, Sikhism and Shintoism. Summer version - Kids explore the major world religions in 12 sessions, with fun, games, stories and interactive activities. Each one-hour session cis chock-full of information, experiences and tangible souvenirs about a world religion. The final session includes a wrap-up game that incorporates symbols and words from all the religions explored. Summer version -In this 12-session program, participants explore rivers representing the six sources of Unitarian Universalism: direct experience of mystery and wonder; the words of prophets and visionaries; world religious wisdom; specific Jewish and Christian teachings about love; humanist attention to science and reason; and Earth-centered teachings. The lessons carried by these rivers enrich the religious ocean in which we swim. The diversity of the sources of Unitarian Universalism reflects the diversity of Unitarian Universalists. That diversity is like the diversity of the cultures of the world. People in different cultures have developed different answers to the universal questions. Likewise, our sources answer different aspects of the universal questions. Summer Version - This 12-session curriculum takes participants on a walk through the peace garden, exploring ways to create personal peace. The structure of the program comes from the poem "Gentle Hearts", using images of roots, flowers and fruit to illustrate ways of building a peaceful way of life. The activities serve mixed-age groups, combining games, crafts and activities ranging widely. Crafts include a large mural featuring footsteps on the peace path, leaves on the tree of good deeds, and peace pinwheels along the picket fence, as well as tabletop peace poles, painted river stones for the garden path, and repurposed plastic bottle flowers. The Culture Company offers products (in addition to our curricula) that add atmosphere to the learning experience; thus the name "Enhancements". In addition, we list some other products that have been recommended to us or that we have used that also contribute to the peaceful culture we are trying to build. See below under "Other Wonderful Peace Products". Culture Crates: The Culture Crates offer a tangible, tactile experience of world cultures and religions. They include toys, games, textiles, musical instruments, costumes, hats and shoes, and statuary and other visual art to evoke a full picture of the culture. The crates may be rented for the duration of your program. See "What People are Saying" for more information about clients such as children's museums who have rented our Culture Crates for their programs. Multilingual Music CD's: We have collected songs and instrumental music from around the globe to enhance the cultural understanding culture campers gain. By listening, singing along, and dancing to authentic music of a culture, campers experience physical learning, which integrates quickly and permanently in their awareness. Classroom Décor: Wall maps, atlases, flags and other articles establish a festive atmosphere and spark research during the camp sessions. Staff Training: The Culture Company offers customized training for teachers and counselors for every program, whether Culture Camp or the various religious education curricula we offer. Our training workshops feature bonding activities for the staff, information about the curriculum, and the opportunity to try some of the activities and crafts and foods that are featured in the Culture Camp Curriculum. We encourage collaboration by our clients who are operating in the same geographical area, to increase communication and diffusion of creative care for children. We focus on giving the counselors the knowledge and inspiration to engage their campers in exciting and fun explorations of our wonderful world. Inspiration comes from understanding; we help the counselors understand their own interesting cultural lives so they can infect the campers with their enthusiasm. In addition, binders contain fact sheets for each culture or religion to provide some background for staff. Walking the world at a teacher training workshop. Outcome measurement: We encourage the application of nationally recognized measurement tools to the Curriculum to evaluate our contribution to your team's ability to fulfill funding requirements. As The Culture Company has evolved, our mission of "teaching peace thru play" has also expanded to encompass programs and products for all ages. We recently launched a new venture, "Peace thru...", aimed at adults of all ages, to help us practice peace in our lives, by helping us all expand our repertoire of peacemaking skills, and practice personal habits of peace. We aspire to follow the advice often attributed to Mohandas Gandhi, to "be the peace you wish to see in the world". Whether or not Gandhi actually said those words, his life was a shining example of one approach to creating world peace: living a life that models peaceful ways of interacting with the world. "Diving for Pearls" is a collection of essays about life's pearls of wisdom, inspiration developed from handling conflicts and facing challenges. The series is available in a workbook format designed to be used by groups seeking to explore their legacies through discussion, journalling and developing their own Pearls. "Preparation Pearls," currently in development, are individual books geared toward preparing for life's stages. Preparenting Pearls, Relationship Pearls, Coming of Age Pearls and Legacy Pearls provide a deeper understandingof the lessons to be learned through experience, and ways to make the most of those lessons. "The Seeker Snail" is designed for tired parents with wakeful children, as well as adult insomniacs. This collection of short meditations takes the form of bedtime stories about a calm character doing dull things very slowly, and is designed to put children to sleep and awaken their parents to mindfulness as a way of life. "Origami Peace Crane Brooches" use recycled materials to reflect the wearer's commitment to walking the peace path. Inspired by the peace cranes made famous by the poignant story of Sadako, our pins are water-resistant and make great hatpins to dress up wide-brimmed hats, pendants for long necklaces, and pins for securing scarves and shawls. "Holiday Peace Calendar" contains inspirational daily messages for the stressful holiday season. When holiday stress accumulates, it's helpful to practice detaching from the rat race to nourish our inner peacemakers. The Holiday Peace Calendar contains short and sweet suggestions for each day of December. It will leave you refreshed and peaceful, and ready to accomplish what's needed to enjoy each special day of that lovely season. Please see our Peaceful Products page for more details about our "Peace Thru..." programs and products. Pricing information is available there and in "To Order".